What better way to sell your new horror movie than by invoking the spirit of a true classic like The Exorcist? The latest one-sheet for The Nun does just that. It's dark and ominous, stirring up feelings of terror and loneliness. A giant church looms overhead. A priest with his trusty briefcase accompanies Sister Irene, played by, perhaps, the greatest living actress of her generation, Taissa Farmiga. And then you have the demon Valak coming out of the shadows. 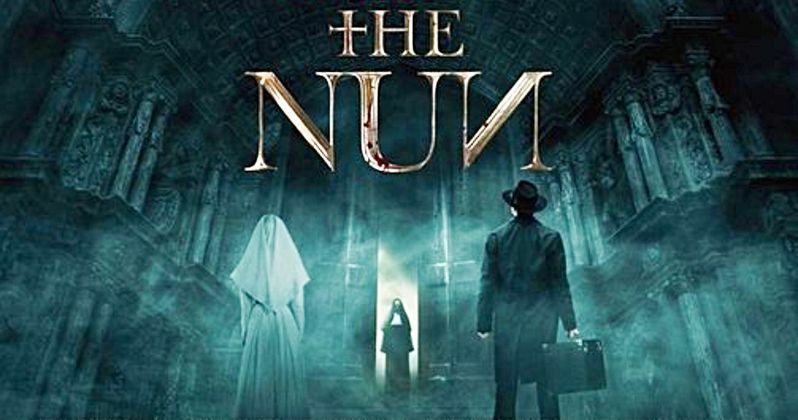 While The Nun boasts a stellar cast for a cheap horror knock-off, including Demián Bichir, Charlotte Hope, Sandra Teles, Ingrid Bisu and Lili Bordan, it's really Valak who is the star of the show here. She's the shark at the center of this religious-themed thriller, which is sure to send sharp shards of terror shooting down even the most hardened of spines. Bonnie Aarons is reprising her role as Valak from The Conjuring 2, where she proved to be the break out character in a movie filled with horrors. Here's the official synopsis from Warner Bros. and New Line Cinema. "When a young nun at a cloistered abbey in Romania takes her own life, a priest with a haunted past and a novitiate on the threshold of her final vows are sent by the Vatican to investigate. Together, they uncover the order's unholy secret. Risking not only their lives but their faith and their very souls, they confront a malevolent force in the form of a demonic nun." That sounds quite scary, and should be a big hit when Valak finally sneaks into theaters this fall. The September 7 release date is just weeks away, with The Nun officially ushering in the fall movie season. The next four months are usually jam-packed with award season contenders. Before this past week, no one would have said Oscar and The Nun in the same breath. But with the Academy's newly introduced Popular Film category, wouldn't you know it? The Nun actually has a shot of walking away with Oscar gold. That is, if it lives up to expectations. The first two Conjuring movies have been huge successes, not just critically but also at the box office and with horror fans. While the first spin-off Annabelle was a big money winner, it left some fans feeling disenchanted. The sequel changed those minds though, so if you're keeping score, the Conjuring Cinematic Universe only has one dud, so to speak. The Nun is billing itself as the Darkest Chapter in the Conjuring universe. And this new poster is certainly teasing those ominous vibes. Anyone who's ever felt their skin burn just a little when walking into a church will surely get chills staring at this towering, powerful art. If you have a thing for nunsploitation, then you might want this gorgeous art hanging on your wall. The rest of us bare wall junkies will just have to be content with this spin-off when it finally creeps deep into our souls next month. IMP Awards brings us this poster from the hallowed halls over at Warner Bros.